Free yourself from the tyranny of the utility companies! With the advent of grid-tied solar systems there are now many solar contractors who have little to no experience with off-grid or battery back-up power systems. These systems are far more complicated to install than their grid-tied counterparts, requiring considerable experience and knowledge of the products and how they integrate. With over 30 years of experience working and living with off-grid power systems, the team members of Greenwired live and breathe off-grid and battery back-up systems. If you're located in Northern California or Northern New Mexico, you can count on Greenwired to design and install the best off-grid system to meet your needs and your budget. With on-staff technical support and the Greenwired guarantee, you can be assured that the system you purchase will be the right one for you for years to come. In the world of renewable energy power, it's often feast or famine. When using solar modules (panels) the sun is where the energy comes from. Using refined silicon and some "simple" chemical technology we can turn that energy into electrical energy. Unfortunately, not every day is a sunny day and there's always night to account for, so we need to plan ahead and save the power we've produced for when we need it most. To deal with this we use batteries to store our excess for times of scarcity. By adding batteries to our solar or renewable energy system we can safely and efficiently store this power for days. Using batteries for storage does add a level of complexity to the system; batteries require specific charging parameters as well as maintenance to achieve their top life expectancy. We use charge controllers to regulate charging from the solar modules and a battery based inverter/ charger to provide constant power to the load (home or business). Combine this with all the wire, breakers and fuses to make it safe, put in a battery monitor like the Trimetric, and we are off to the races. Of course, not every application needs batteries! If you only need power when the sun is out - say, for running fans when the sun shines, or using a pump to fill a tank or pond - you can always go solar direct. Greenwired is focused on our off grid clients and supplying what it takes to make life off the grid happy and renewable. All three of the owners and managing partners grew up living off the grid, and they still live every day with solar and renewable energy systems on their homes. Include that background with hundreds of off grid power system installations and you can be sure we know what it is like to live off grid. Here is a list of things it is important to remember when living, building, or working off grid. In the off-grid world we have to produce every unit of energy we consume. It is cheaper and easier to save power than to make it. To that end choosing super efficient appliances and lighting will save you money and hassle in the long run even if it is more costly in the short term. Look for energy star appliances and LED lighting. Avoid Electric Stoves and heaters, as well as AC units (unless you plan on building a large renewable energy system). Instead, choose propane or natural gas and swamp coolers when applicable. As your life off-grid grows, so do your power needs. When designing a power system keep in mind that in the future it is likely that you will want to increase the size and capacity of the system. This means leaving space for a larger battery bank, another inverter, more solar panels, etc. Please don't put your power system in a crawl space or under a deck! 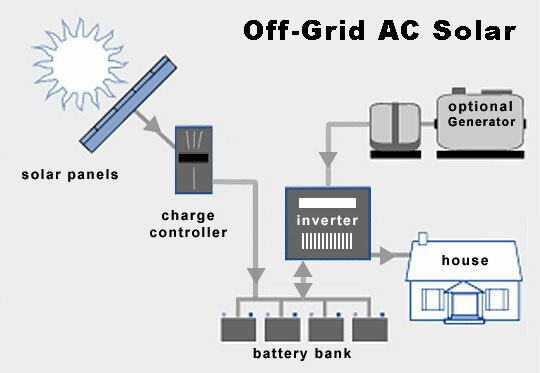 Off grid power systems need servicing and maintenance. It is less likely that you will water your batteries if you have to crawl under the house to do it. In fact, if possible build a freestanding power shed to house your off grid batteries and inverter - ideally with drive-up access as batteries and inverters are heavy and difficult to move. If you are going to have a back up generator chose one with remote start capabilities, that way you can use an Auto Generator Start (AGS) module to start and stop the generator when the batteries need extra power. That way you can trust that the generator will run when needed preventing your batteries from over discharging and causing them harm. Include a battery monitor that will be mounted in your living space so you know what is happening with your system from the comfort of your couch. That way you can smile and relax while watching the sun, wind, or water fill your batteries! These units can also tell you how much power you are using with just a glance. It is not uncommon for wells to be drilled or water to be collected from springs or ponds where there is no power. Fortunately using solar energy to pump water is one of the simplest ways to use the sun's power. Greenwired offers many different lines of solar direct water pumping options to fit your need. With the use of solar direct water pumping, when the sun shines the water flows uphill. From surface pumps, pressure booster pumps, to submersible pumps Greenwired has your solar water pumping needs covered. Some of these pumps can also be used with standard AC (Gen. or Grid) power as a backup as well, giving us the ability to pump water for emergencies when the sun is not shining. Let the sun pump your water, no more noisy gas pumps or expensive power bills, just clean, quiet, flowing water. 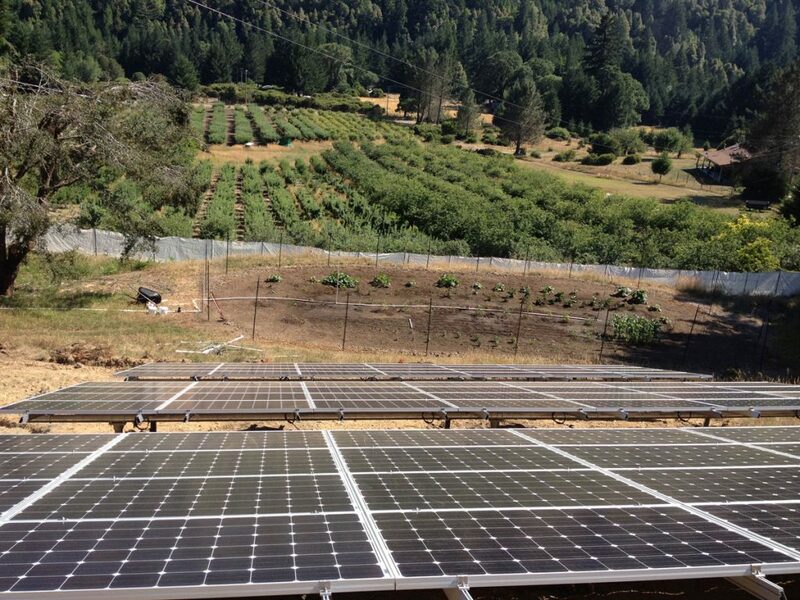 With experience in designing installing and maintaining micro grids that supply power to many communities and businesses in remote locations, Greenwired is the go-to company for those with large off grid needs. From Telecom and data centers to remote eco tourism lodges, Greenwired has the experience to design a system that will work with the elements and the demands of your rugged rural needs. Contact us if a simple stand alone system is not enough to meet your needs, and Greenwired will design and build a stand alone or battery backup system that will work flawlessly for you for years to come. Micro Hydro is the largest contributor to our national renewable energy portfolio. While large scale hydroelectric systems come with their own significant environmental problems, small scale hydroelectric systems are environmentally friendly and can be a superb addition to your home electrical system. By using the land's natural topography we can install a penstock (pipe) that follows the run-of-the river to create pressurized water, we then use this to spin a turbine creating electricity and then return the water to the stream or river. If you are lucky enough to have a strong running water source flowing downhill, you will likely have clean power available as long as the water flows. Greenwired carries a large selection of micro hydro systems. From instream intakes and pipe to turbines and controllers, Greenwired is your one stop shop for micro hydro equipment, design, and installation. Greenwired is proud to partner with Ygrene Works, offering no money down, 100% PACE financing for your solar project.